Adults of N. fungicola are easily recognized by their striking colors: the head, pronotum, and elytra are brilliant golden-red, and the abdomen is shining black with patches of whitish pubescence and a bright yellow apex. These relatively large (up to 1.5 centimeters in length) staphylinids fly vigorously around rotting fruitfalls and fungi during the day, frequently landing on the surrounding vegetation where they engage in a variety of behavioral interactions with conspecifics and others. 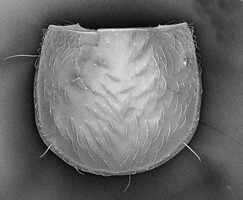 The natural history of N. fungicola was examined by Chatzimanolis (2003). 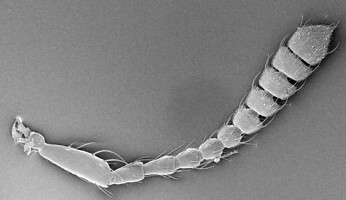 Recently Chatzimanolis (2004) described the larva for these beetles. 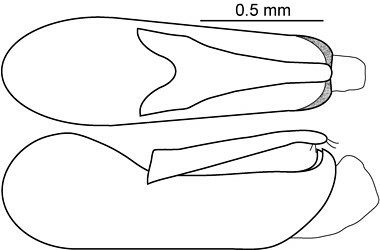 Abdominal sternum VIII of (left) males and (right) females. © 2003 Stylianos Chatzimanolis. 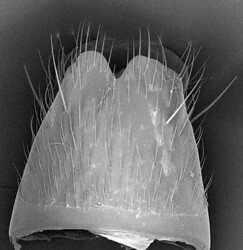 From left to right, pronotum, antenna and protibia of N. fungicola. © 2003 Stylianos Chatzimanolis. 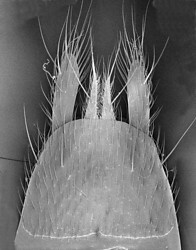 Aedeagus of N. fungicola, upper image dorsal view and lower image lateral view. © 2003 Stylianos Chatzimanolis. Adult beetles flew vigorously around rotting fruits on the forest floor (palm or Gustavia superba) or fungi. Upon landing on the substrate, they always raised their abdomens over their backs and waved them antero-posteriorly four or five times, followed by a slower side to side movement, and prominently displayed the brilliant yellow apex of the abdomen. All other species of staphylinid beetles observed in the field waved the abdomen up and down or side to side only; they were never observed to wave their abdomen in a such a way. 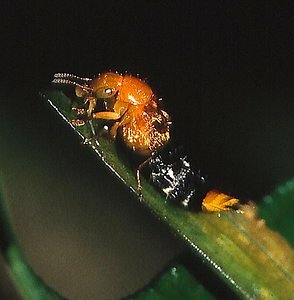 Individuals were observed using the waving of their abdomen (and presumably chemical secretions) to avoid Ectatomma ants. Mating was observed only near sources of food (fruits or dead insects). When a female landed on the substrate, the closest male attempted to mate with her. 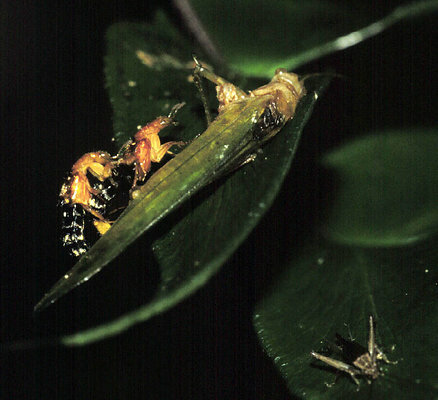 Females sometimes avoided copulation by rapidly waving their abdomens when the male tried to mount them. 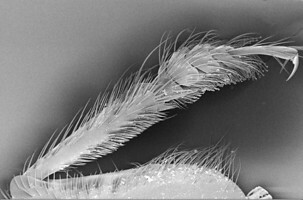 There was no apparent courtship before copulation except that males slowly approached females from behind, and touched their antennae to the female abdomen for a second before attempting to mount. Mating pair of Nordus fungicola. Barro Colorado Island, Panama. © 2001 Stylianos Chatzimanolis. Chatzimanolis S. 2003. Natural History and behavior of Nordus fungicola (Sharp) (Coleoptera: Staphylinidae). Ann. Entomol. Soc. Am. 96(3): 225-230. Chatzimanolis S. 2004. The larva of Nordus fungicola (Sharp) (Coleoptera, Staphylinidae) with notes on natural history. Dtsch. Entomol. Z. 51(2): 221-224. Nordus fungicola video clips. Low resolution video files of several behavioral aspects for these beetles. Page: Tree of Life Nordus fungicola. Authored by Stylianos Chatzimanolis. The TEXT of this page is licensed under the Creative Commons Attribution License - Version 3.0. Note that images and other media featured on this page are each governed by their own license, and they may or may not be available for reuse. Click on an image or a media link to access the media data window, which provides the relevant licensing information. For the general terms and conditions of ToL material reuse and redistribution, please see the Tree of Life Copyright Policies.